I have a fun new finish to share today that I am so excited about . . . And keep reading to the end because I also have a Special little announcement that is equally exciting!! So baby quilts are probably my favorite size quilt to make. Sure they go together fast, but it is so much more than that. I just love that while I am putting a baby quilt together I keep thinking about a sweet little wee one on it's way to a family I love. This particular quilt happens to be for my twin sister who is expecting her first boy, (second child) next week, and I am so excited for my nephew to arrive!!!! So, I pulled out my treasured Pure by Sweetwater fat quarters that I had been stashing away for just such an occasion. They have that same wonderful brown, white, and blue vibe that Snuggle Squares has, except for pink of course. And Now . . . How about that Special Surprise. Next week is . . . I can not believe it has already been 3 years. Never in my wildest dreams would I have guessed 3 years ago that Happy Quilting would be where it is today. What an amazing journey. I am so grateful to all of you, my readers, for making this such a wonderful experience for me. It would not be anything without all of you!! And now I just can't wait to see where things go in the next year. So That's it for today!!! 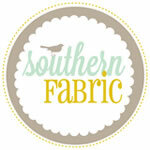 See you next week for the Happy Quilting 3 Year Blogiversary Celebration!!!! I love making baby quilts and now that I have a grandson, it is even more fun to make things for him. I finished quilting one last night, now i have to do the binding and have it ready to give him, this weekend. Congrats Melissa! I've recently found your blog and I'm really enjoying it! Congratulations and thank you for sharing the video about the quilting pattern, I love it . Time flies when you are busy sewing! Congratulations! Congrats! It is a milestone to be excited about. Will be looking in next week. I love to hear (reading) about peoples journeys! What an awesome aunt you are. I pray all goes well with the new arrival. And congrats on three years - time flies when we are having fun! Three years! Thanks for inspiring us along the way! what a lovely quilt. I know your sister is going to love it. thank you for the pattern. congrats on 3 years. Thank you for sharing the baby sized directions, It's a beautiful quilt. Congratulations! You have accomplished a lot over the last 3 years. Thanks for the free download and congratulations on the last 3 years. I enjoy reading your blog. Happy Blogiversary Melissa! I love how the Pure line turned out in the refraction quilt. It is a perfect combination for a boys quilt. Congrats on 3 years :) Thanks for sharing the baby sized Refracted! Both quilts are so cute!! The new quilt is wonderful. I love pure, helped a friend make her first quilt for her granite using that line. Congrats! Congrats Melissa. I love the Refracted quilt too. The new baby's quilt is gorgeous Melissa. Congratulations on 3 years of blogging. Love the quilt you made for your nephew and Congratulations on your soon to be blogiversary! Congratulations on your milestone Melissa! You do such lovely work, I love to drop in and see what you're up to. Great looking quilt for your nephew! Congratulations on your blogging milestone and congrats on that darling quilt! I am so happy to be a follower of your blog! Congratulations!! It is so amazing! I too will be having my three year anniversary soon. You have done so many wonderful things I can't wait to see what you have coming up next week! Love your baby refracted! It is o pretty and so fun. I love how different fabrics can change the look of the quilt. And Happy 3 year blogiversary! 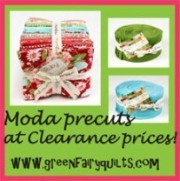 Those are super cute baby quilts - great work! Congrats on your 3 year blogiversary! 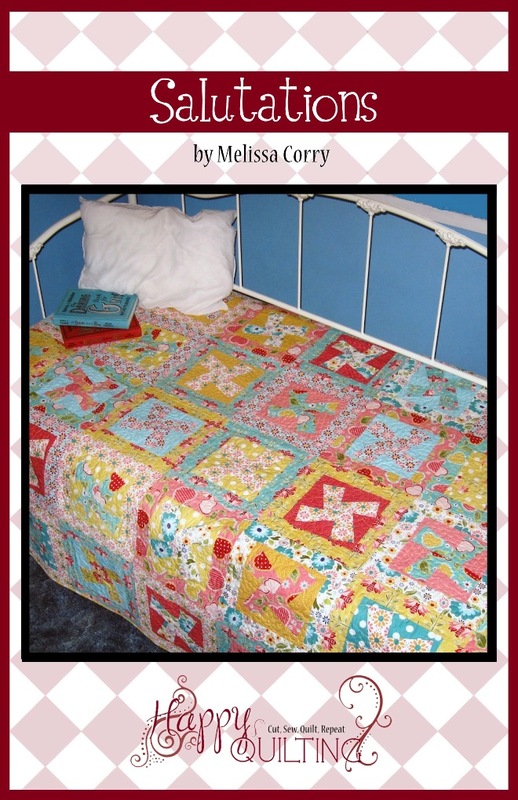 What a great quilt, Melissa - and a free tutorial too? How awesome is that! Congratulations on your 3 year blogiversary - whoop whoop for you!! The blue baby quilt is terrific. I'm sure your sister will be thrilled with it. I hope this is being enjoyed by the recipient now :o) Happy bloggiversary! That is such a great boy quilt. Thanks for the tutorial for the quilting pattern. Happy Bloggiversary!